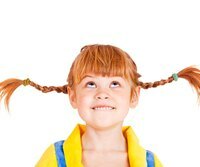 That endearing character from childhood may show up in your home next Halloween, but your child's Pippi Longstocking costume just isn't complete without that widely recognized hairstyle -- two braids sticking out perpendicular to her head. Yarn braids and wigs don't really have the same wow factor as natural braids do. If your child has medium-to-long hair, use a few accessories and products in her hair to create the signature Pippi Longstocking look. Once you master these outstanding braids, your child's eye-catching costume will not only win a few laughs, it might even win the next Halloween contest. Brush your child's hair thoroughly to remove any tangles. Spray the hair evenly using either red or orange spray-on hair dye, which you can find at any party supply or craft store. This gives your child's hair the correct color for Pippi Longstocking hair. Part your child's hair neatly down the middle with a comb, and secure two low ponytails on either side of your child's head using elastic hair ties. If you do not want to see the hair ties, choose hair-tie colors that match or blend in well with her red or orange hair. Stretch a piece of 16-gauge plastic coated craft wire the length of one of the ponytails, and cut off the excess wire using wire cutters. Repeat this process so that you have a wire for each braid. You can substitute heavy-duty pipe cleaners if you do not have craft wire. Slide one of the wires or pipe cleaners down through the middle of each ponytail, allowing the hair tie to hold it in place. Slide the second wire or pipe cleaner into the other ponytail in the same way. Curl up the ends of each wire or pipe cleaner with needle-nosed pliers and wrap the ends with electrical tape. This will prevent the ends from cutting your child's skin or scalp. Braid the hair on each ponytail around the wire or pipe cleaner, securing an elastic hair tie at the end of each braid. Bend and curl both braids up into the classic Pippi Longstocking U-shaped braids. Use bobby pins to cover up any obvious-looking wire with hair. To embellish the Pippi Longstocking braids, tie colorful ribbons or clip small bows on to each braid end. Keep sharp wires and wire cutters away from children.